Let’s talk about money, baby. Let’s talk about positivity. Let’s talk about all the good things and the bad things money can bring. Let’s talk about money. Let’s talk about money! I’m about to write about the most taboo topic…MONEY. But first off, let’s come to an agreement that we are going to get really comfortable with being uncomfortable talking about money. “I do solemnly swear that I’m going to be open to talking about money.” In the book, The Smart Cookies, they say that most women probably have no problem telling their girlfriends about the great deal they got on clothes or shoes, but they never talk about personal finances. It’s not only okay to talk about money, but it is essential if you want to become financially abundant. Starting today, I will be writing a series of blogs on this topic to help you release limiting money beliefs, get to know your numbers, and reduce money stress. 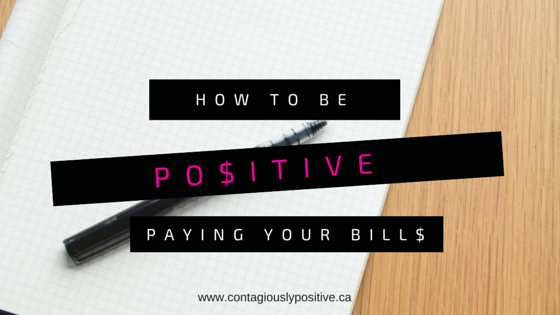 Today, the first step I’m going to write about is gratitude, specifically towards paying bills. I talk about gratitude a lot and when it comes to having to pay bills, gratitude plays a very important role. In my college years, I really struggled with money. It took me years to pay off my school loans and credit card bills and I hated opening the mail and seeing another bill. I dreaded it! I thought my money mindset changed when I started making good money and didn’t have to worry about paying the bills anymore. However, when I left my regular paying job, it really hit me that I had no appreciation for money because I quickly reverted back to fear and dreading the bills when I didn’t have that regular paycheck coming in anymore. My money mindset really shifted towards the positive when I became an entrepreneur. It shifted even further when I learned that 50% of the world lives on $2 per day. What am I complaining about?! I knew that if I was going to attract financial abundance, I had to change my money mindset. That means being happy with what you have, so you can attract more of what you want. I had a new appreciation for every single dollar that I made and where it was going. There is no “regular” paycheck unless I serve my clients, work at getting workshops and speaking engagements, and putting in the work. Do you dread opening up the mail and getting another bill? Do you curse and get upset at every bill you pay? You are not alone and it is time to get an attitude for gratitude and take control! To start your journey to having a positive mindset around money, I believe it starts with your attitude about the bills you have to pay. You also need to know your numbers and budget, but that will come in the next blog. Baby steps. I have learned and believe that you can’t attract more financial abundance if you are not grateful for what you currently have. You will be amazed at how abundant you feel, even with the smallest of things and even when you don’t have everything that you want at that moment. That is what gratitude does. You truly can make things that you hate doing more positive and paying the bills is no exception. If you want to try something new, here is my bill paying ritual. Step 1 Is To Create A Positive Atmosphere. Set a date, maybe two, depending on when your bills are due, and create a really nice surrounding for yourself. For me, I light a candle and I organize everything that I will need. If you still pay your bills by sending checks in the mail, send them in pretty envelopes and make it look like happy mail. Imagine the person’s reaction when they open the mail and see your bill payment inside of pretty stationary. They will feel that positive energy. I actually miss the days when I could do this, but I love the convenience of paying everything online. For the gas bill, be grateful that you have heat to keep you warm on those cold winter nights or keep you cold on those hot summer days. For the electricity bill, be grateful for the light and power it provides. It powers your refrigerator, stove, lights, charges your cell phone, laptop, allows you to flush the toilets and so much more. For the phone bill, be grateful that you have the ability to communicate with your friends and family. For the cable bill, be grateful for having the ability to watch your favorite television shows or movies. For your property taxes, be grateful that you own a home that you can calls yours and provides you with safety and comfort. For your car payment and car insurance, be grateful that you have a vehicle that can get you to where you need to go and insurance that will cover the replace if your car is damaged. For your groceries, be grateful that you have the ability to put food on the table for you and for your family. Once all your bills are paid and you’ve mentally expressed gratitude, say thank you, blow out the candle and give yourself a pat on the back for taking such a powerful step towards changing your money mindset, feeling abundant and of course attracting more abundance and positivity into your life. If you think this process is crazy, what’s crazier, being pissed off every time a bill comes in, or creating a process that makes you feel positive? 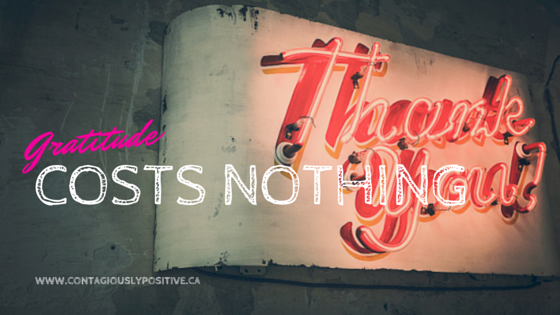 The best part about gratitude and being thankful…it doesn’t cost a thing! ← No More Boring Salads!